Spring is here and it is not kidding around! Why not whip up a little light lunch and take it outside? Grab some friends and dine out on your porches and patios with these tasty recipes from guest chef, Cara Valla. This recipe is super simple and really has to be tailored to taste. If you are a vinegar lover...splash a little more in. If you love the creamyness of the yogurt and want to make this salad more like a sauce, by all means..keep those spoonfulls of yogurt coming! This salad is great as a sauce for lamb or chicken or the meatball recipe below, or even to dress up a hamburger. 1) Slice cucumbers in half lengthwise (I keep the peel on but that is another preference thing!) and cut into desired thickness. 2) Slice onion as thinly as possible. 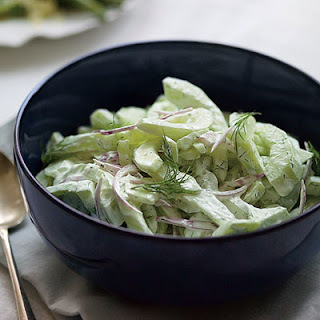 3) Combine the two and season with salt and pepper, dress with vinegar and yogurt, and add dill just before serving. Meatballs are often disregarded theses days for being either too simple or too old school, but there is nothing like a nice, juicy, crunchy-on-the-outside, tender-on-the-inside meatball! These can be made with your ground meat of choice - turkey, beef, pork or lamb. 1) Soak bread in milk to rehydrate and then squeeze out as much liquid as possible. 2) Slice onion and combine with herbs in food processor, pulse to puree (if you do no have a food processor just chop onions and herbs finely). 3) Combine bread, onion, nuts and meat, mix and season. 4) Form into small meatballs and pan fry gently in oil until cooked through (if you use olive oil be aware is has a lower burning point than canola or vegetable oil so keep an eye on it). 5) Serve meatballs with cucumber salad and a nice hunk of crusty bread.